The establishment of an independent Hungarian military troop was ordered in 1868. The establishment of an officer class was a particular necessity as the Academy Ludovika, the only officer cadet school in Hungary, could not meet the requirement to train a sufficient number of senior officers for the new army. Therefore, by an act of Law in 1897, three other cities were given the task of training cadets: Pécs, Sopron and Nagyvárad. The famous Hungarian architect, Ignác Alpár was appointed to design the building in Pécs. The three-storey, E-shaped Cadet School was built in neo-baroque style along the Szigeti road. The school was built to train 400 students and comprised 160 units: on the ground floor there were the dining rooms, a ball room, a pool room, a lounge, a gym, (with a swimming pool in the basement), a fencing room and a target range. The classrooms were located on the first floor, the dormitories (each with 20-30 beds), the assembly hall and the chapel were on the second and third floors. Between the two pillars of the entrance gate the motto of the institution was inscribed: Armis et Litteris (Weapons and Literature). A further complex was built on the right-hand side of the school, serving the families of the officers, with a number of annexes, such as a laundry, store houses and also the jail. The building work began in 1897. It was such a large construction that 4 million bricks were needed and up to 1,000 workers were employed at the construction site. The building was complete within a year, by the end of 1898. During the 21 year operation of the Hungarian Royal Officer Cadet School in Pécs, it was headed by the following six commanders: lieutenant colonel Béla Sorsich (1898-1903), captain György Sypnievszky (1903-0905), colonel Dezső Nónay (1905-1911), lieutenant colonel Mihály Csermák (1911-1914), lieutenant colonel Miklós Petrás (1914-1917) and lieutenant colonel Sándor Riffl (1917-1919). 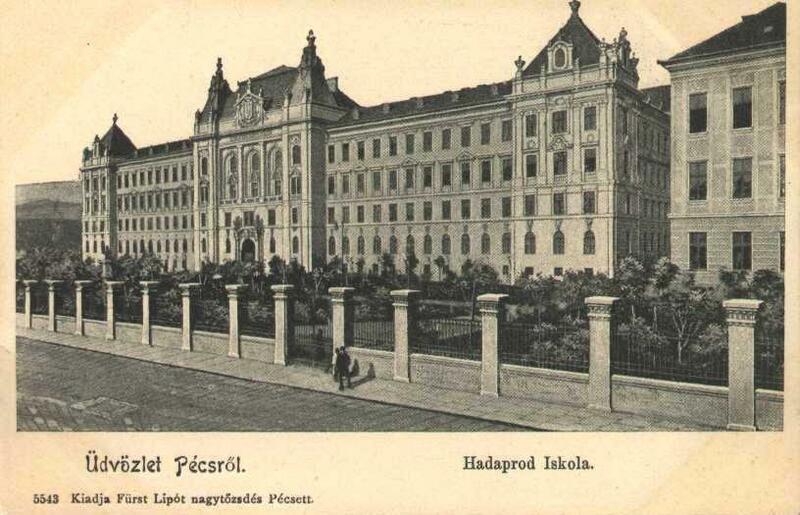 The Hungarian Royal Officer Cadet School was transferred to the West of Hungary in 1918 and moved back to Pécs in 1922. Its name was frequently changed depending on the international political situation. From 1922 the institution was called the Hungarian Royal Boarding School Pécs, and from 1936 Hungarian Royal Miklós Zrinyi Cadet School. The Cadet School held its last academic year in 1944, from the following year it functioned as an Officer Training School named after a famous Hungarian historical figure, György Dózsa. 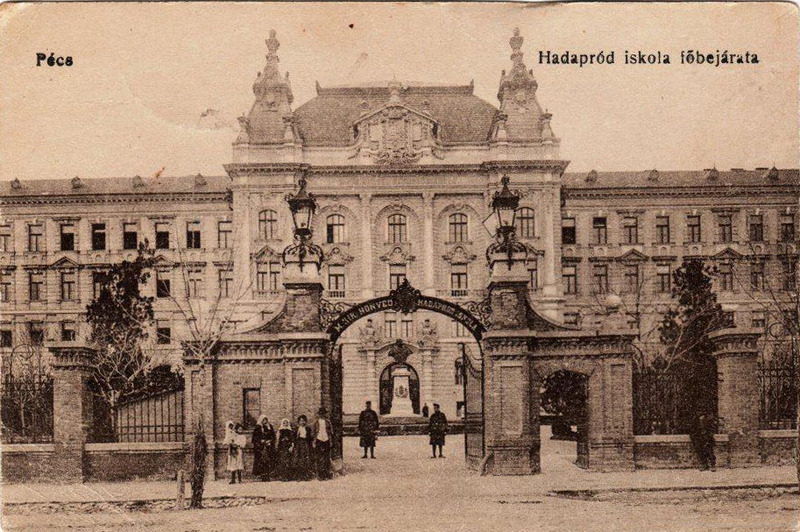 In 1956 the buildings of the Cadet School and the associated lands were handed over to the POTE (Medical University of Pécs, at those times being an independent university from the University of Pécs). Initially, a 400-bed clinic was built and then the main building housing the teaching and research institutes of the Medical School were constructed. It is worth mentioning that while the construction of the Cadet School took less than a full year, the redevelopment of the building took more than 5 years. The handover ceremony of the renovated school took place in November 1970. The complex has functioned as the main building of the University of Pécs Medical School ever since.